I had this first painting built several months ago, but didn’t quite know where to go with it until I had this aha moment on Monday. I realized that I would use an idea that’s been lying around in my sketchbook for several years. At the time that I made it, I wasn’t sure what to do with it. 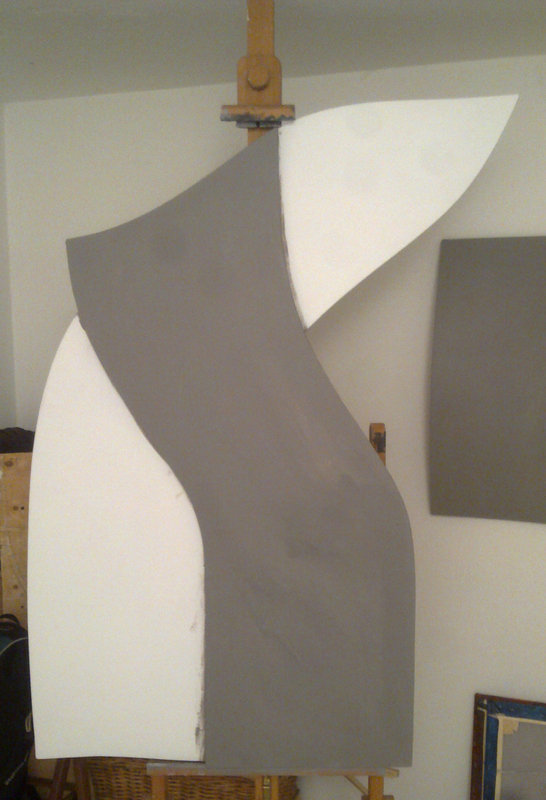 The strange thing was that the sketch seemed to be tailor-made for this oddly shaped canvas several years later. It was a serendipitous moment to say the least. I felt inspired after meeting up with artist John Daily at his exhibition today. After returning to the studio, I immediately jumped into the actual painting of this canvas. I had completed a loose drawing yesterday and often work a lot of detail into my drawings before continuing. Today, however, I decided to let the painting simply unfold. With this one, I am going to try and let the brush strokes remain loose. It’s probably too early to see what this painting represents, so I’ll tell you that it’s loosely based on a city scene. It might even remind those of you, who know my work well, of my “discarded scapes”. I think that this painting will actually be a long awaited continuation of that series. Still in the development stages when it comes to incorporating lighting, but it’s an idea I’ve been exploring for a long time, now.